After lunch Dave G. and I threw our rods and gear in his rental car and decided to drive to the Eagle River and give it a try. Dave G. felt we needed more volume in order to use nymphs as the fish were hugging the bottom of runs and riffles in depths of three to four feet. Dave G. suggested trying the water below the Eagle County Fairgrounds across from the confluence with Brush Creek, and I agreed as it would be fun to try water that I’d never fished before. We parked in a large dirt oval parking lot beyond the fairground parking and hiked down to the river. Some high slate clouds moved in from the west and the wind kicked up, and I was wishing I’d worn another layer. 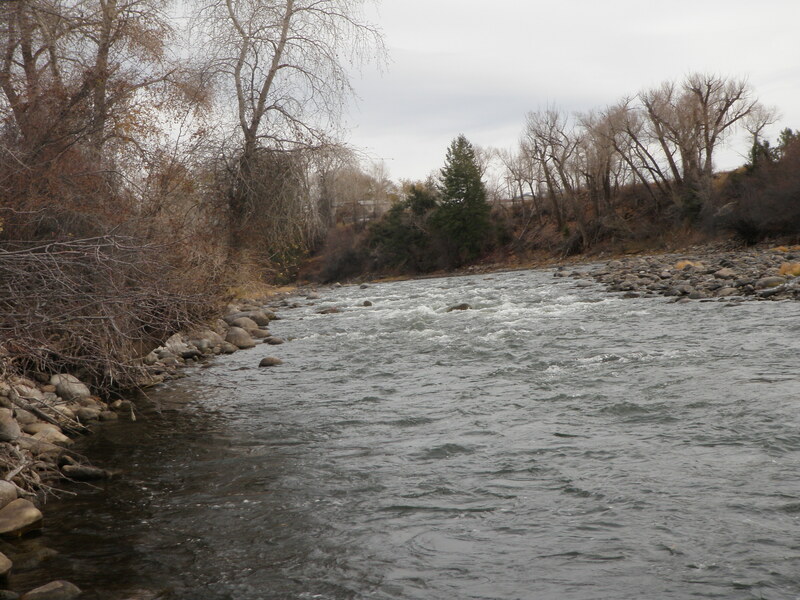 When we arrived at the river, we noticed another fisherman on the opposite bank positioned to fish the sweet riffle below where Brush Creek entered. Dave G. called out to ask how he was doing, and he replied that he was having great action drifting nymphs slowly along the bottom. He recommended a Prince nymph and jujubaetis and invited us to fish the riffles on our side of the river across from him. Dave G. seemed interested in doing that as he was already set up with a strike indicator and nymphs, so I told Dave I’d work my way upstream along the bank. 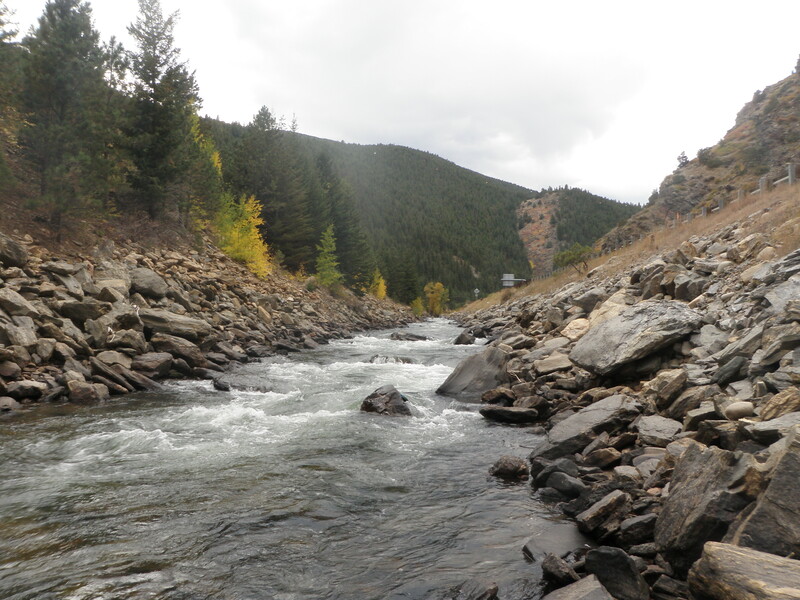 I began casting the parachute hopper and trailing BHHE upstream along the bank and to attractive slots and pockets behind boulders within ten to fifteen feet of the left bank. I approached a nice run that tumbled between some boulders that left a nice slack area along the bank that was approximately ten feet wide and flicked a twenty foot cast to the lower end of the side pool and within a couple feet of the bank. All of a sudden the hopper dipped and I set the hook and played and landed a nice brown that extended beyond the length of my net. This was quite a surprise after the lackluster experience on Brush Creek. Now feeling re-energized by the recent action, I moved up along the left bank with increased focus and intensity and sure enough landed four more browns, all on the trailing beadhead hares ear. 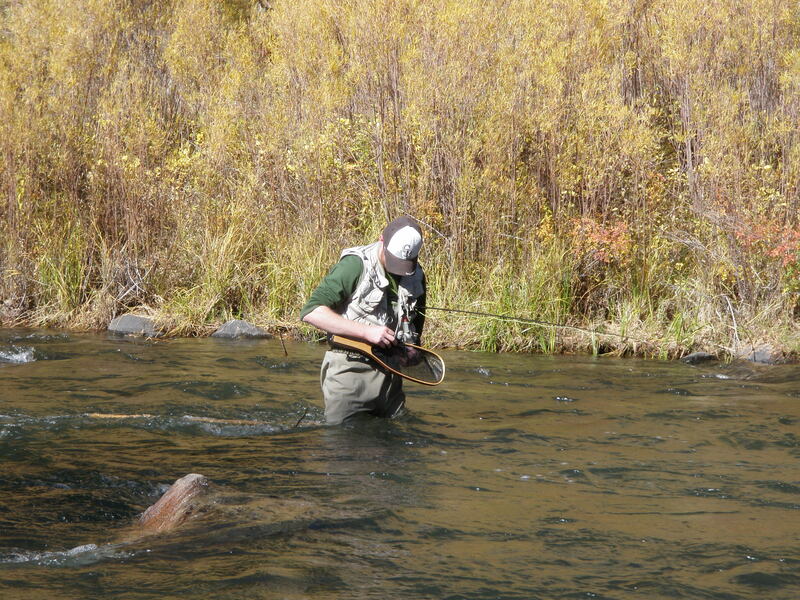 All the fish were taken in long pockets and riffles with three to four feet of water depth. I was feeling quite chilled by the wind, but as long as I was having success, I could ignore the discomfort. I now reached a spot where the river divided around a small island, and landed my fifth Eagle River fish from a nice slot where two currents merged below the island. As I played and released the fish, Dave G. approached and inquired about my success and what was working. After filling him in, he retreated downstream below me forty yards or so and I waded to the point of the lower end of the island and began fishing a nice deep run on the larger south channel. I didn’t have any success but there was a sweet deeper run on the opposite side of the strong mid current and after I’d covered it with some long casts using the hopper/dropper I decided to prospect with a streamer. I tied on the orange and black woolly bugger and on one of the sweeps along the far bank a fish bumped the fly and I set the hook and felt the throbbing of a fish. I played the relatively small fish for a bit and it got free. Next I decided to try going deep with a strike indicator and tied on a prince nymph and a split shot. Before I could add a second fly and indicator, Dave G. began calling to me and was walking up along the bank. I couldn’t hear him over the rushing water next to me, so I retreated toward the shore where he stood. He was pointing down toward his feet, and I soon discovered he was pointing to his wet fleece vest, and he had stumbled and went in the river over his waders. Given the cold overcast sky and the wind, we quickly hiked up to the car and turned the heater on and returned to the house for hot tea and a hot shower. It was now late in October and I managed to come within nine fish of last year’s cumulative count. I have to admit this was on my mind as Jane and I prepared to drive to Eagle on Saturday morning to visit the Gaboury’s at their home in Eagle Ranch. My expectations weren’t high, but it would be nice to close the gap on last year’s numbers late in the season. Knowing Dave G’s love of my beadhead hares ear nymphs, I tied five new ones on Thursday night while watching the seesaw game six of the World Series. Jane and I got off to a late start on Saturday morning and arrived at Eagle Ranch at 11AM. Dave and I decided to try Brush Creek directly behind his house for a couple hours and then re-evaluate when we returned for lunch. Beth and Jane planned to drive to Glenwood Springs for the afternoon. We put on our waders and strung our rods and hiked down the bike path until it intersected with Sylvan Lake Road at the western edge of Eagle Ranch. The stream level was ideal and higher than when I’d visited in mid-August. I told Dave I was going to try some streamer fishing, so he led me to a nice deep hole where the main current angled against the bank and then made a sharp bend. I searched through my fleece fly pouch and decided to start with a muddler minnow. I pinched a split shot on the line a foot above the streamer and cast across the current and let the fly sweep through the heart of the pool. I worked the muddler across different distances and stripped in various ways, but nothing was moving for the fly. I wasn’t satisfied with the sink rate, so I clipped it off and tied on a different streamer that didn’t contain buoyant deer hair. This fly sank better but didn’t produce either, so I went to a third streamer, an orange body woolly bugger with a black tail. This fly looked good as the marabou tale undulated in the water, but once again no action resulted. I moved on up the stream casting the woolly bugger to some additional deeper runs and pools, but I wasn’t seeing any fish and finally decided to give up on streamers and try a parachute hopper with a beadhead hares ear. By this time Dave G. and I became separated, and I wouldn’t catch up to him until I was nearly at the bridge that crosses the creek to the visitor center for Eagle Ranch. 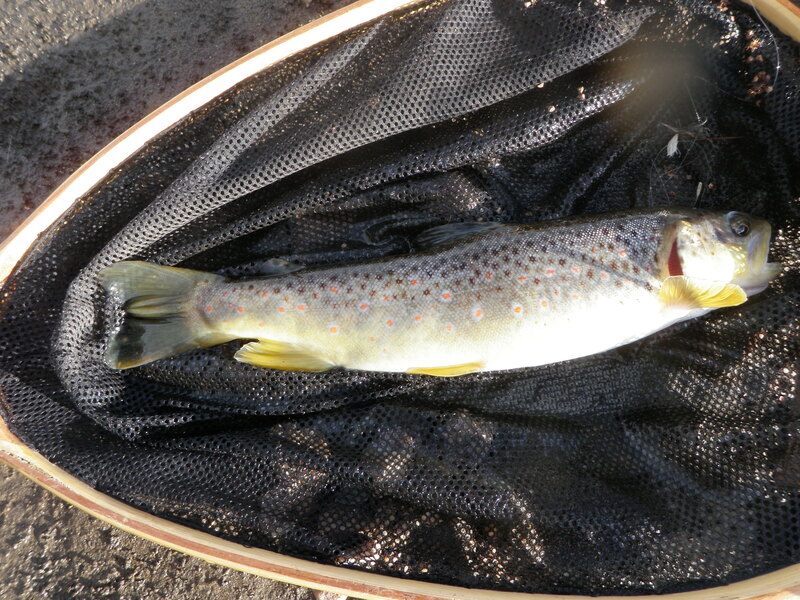 I covered a lot of water and finally in a riffle near the bridge, I hooked and landed a 10 inch brown trout. Dave G was just above me and I asked him how he’d done, and he replied that he’d landed one 10 inch brown near where I had just landed my first fish. Fishing is supposed to be a quiet non-competitive pastime and an escape from life’s many constant pressures, but for some reason I keep falling into the trap of counting fish and achieving goals. The last two outings in October exceeded my expectations and brought me within 18 of 2010’s cumulative total of 530. Was it possible to catch another 18 fish and equal last year’s total? Sunday was forecast to be yet another warm late October day with highs in Denver in the 70’s, so I decided to give fly fishing another try. 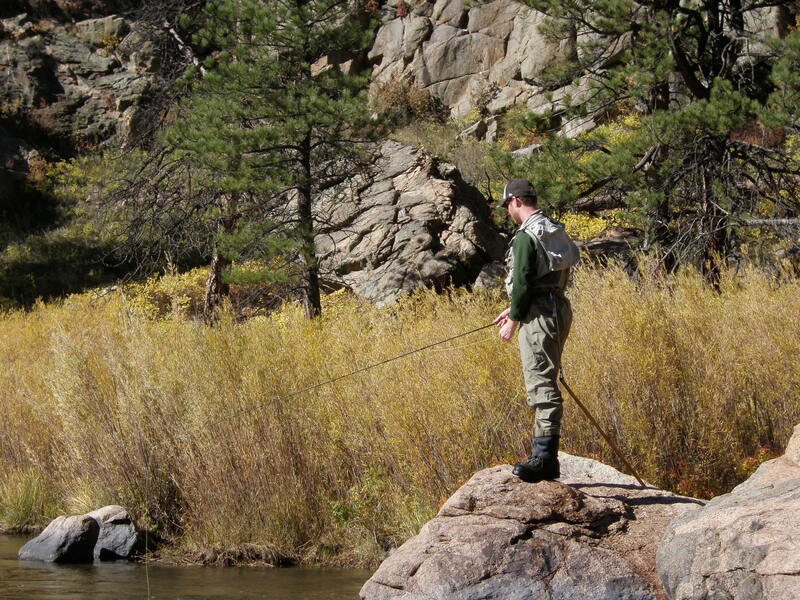 I drove to the Big Thompson below Lake Estes and arrived and prepared to fish by approximately 11:30AM. I discovered that the fishing doesn’t heat up until early afternoon with the cold nighttime temperatures requiring more sun to warm the water to an optimal feeding range. 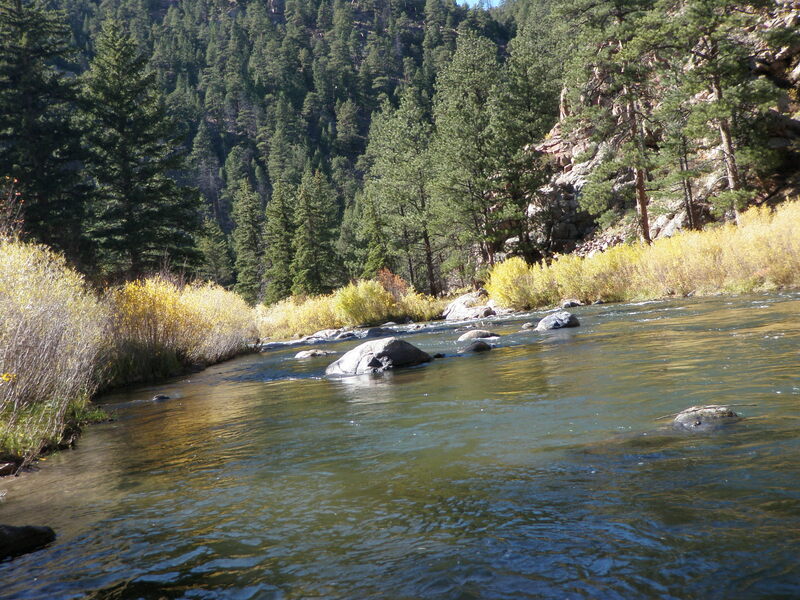 I elected to walk below the bridge to the next bend and began fishing my way back upstream toward the Santa Fe. I tied on one of the light gray deer hair caddis I’d made in preparation for the trip to Wildcat Canyon and began flicking casts to the likely holding spots. After working my way upstream 15 yards, I made an across stream cast in front of a large rock tight to the opposite bank, and a decent rainbow tipped up and sucked in the caddis. This was an auspicious start to my day, and I continued working my way upstream to the bridge. In another spot tight to the bank and below a rock, a fish flashed to my fly but refused it possibly due to the start of some drag. I carefully waded through the darkness under the bridge and came to a wide relatively shallow area. I startled several nice fish as I began to cast and didn’t meet with any success until I moved further upstream to a narrower chute section. I wasn’t drawing additional interest in the caddis, so I tied on a cream body parachute hopper, but that fly also didn’t produce looks or takes. 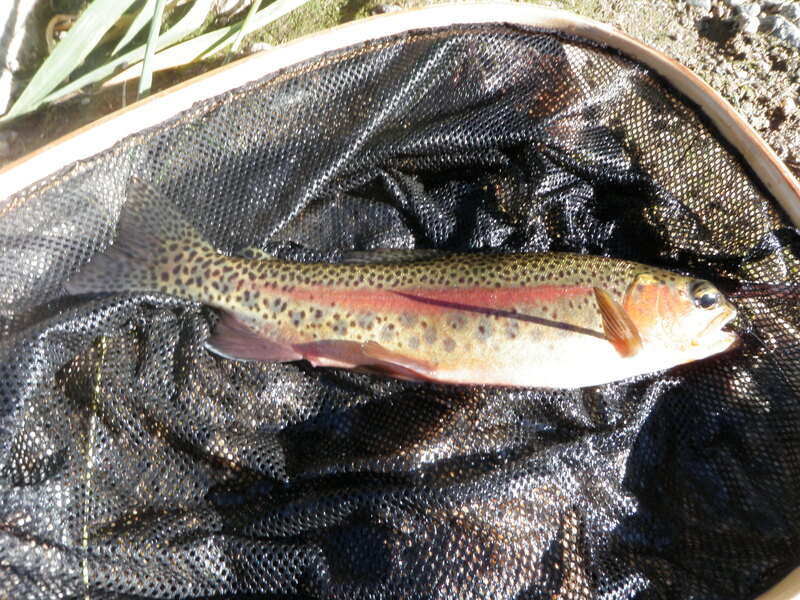 Following the script of the Wildcat Canyon trip, I added a beadhead hares ear nymph dropper to the parachute hopper, and this finally produced a second trout, a small brown, on the BHHE. 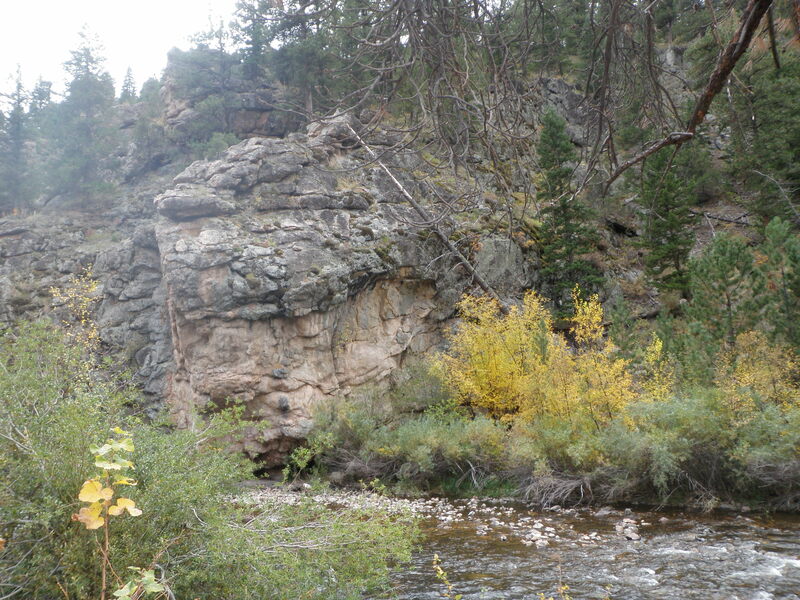 I was now positioned below a steep bank directly opposite the Santa Fe so I climbed out of the water and negotiated the large rocks and ate part of my lunch. I tuned in the Broncos to discover they were losing 6-0 to Miami at the start of the fourth quarter. After lunch I resumed fishing the hopper/dropper combination and covered quite a bit of water from the car upstream and around the bend beyond the tidy cabin on the road side of the river. I landed another four fish, all on the BHHE and was feeling better about the day; however, the water I was anticipating was behind the cabin as this was where I had great good fortune on my last visit catching very nice rainbows. Unfortunately the water was totally covered in shade in this area, and the air was quite chilly without the benefit of the sun. I also had difficulty seeing the large upright white wing on the parachute hopper. I wasn’t generating any action or even refusals and was getting quite chilled so I decided to call it a day at six and around 3PM. I trudged back to the car, but then decided to walk over the bridge and check out the water I’d begun fishing in the late morning. The sun was still shining on most of the water downstream for 50 to 75 yards below the bridge, so I kept walking until I reached the point where shade was encroaching. I hustled down over some rocks and tied an olive body caddis to my leader. 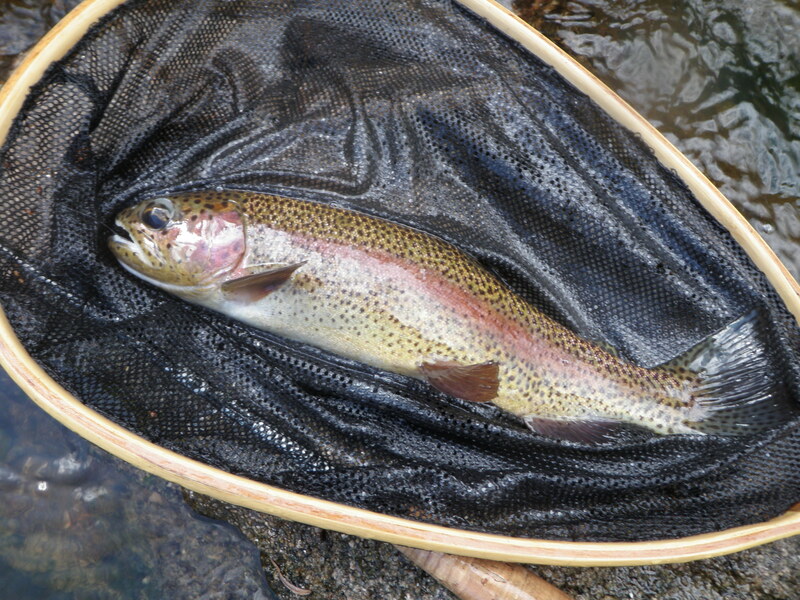 It didn’t take long before a decent rainbow flashed to the surface as the fly bobbed along a current seam, and I eagerly landed number seven. I continued working upstream at a rapid pace making no more than three casts in likely spots and by the time I’d reached my starting point I’d landed two more fish to total nine on the day. Fishing in the sunlit sections of the river appeared to produce more ready fish than the chilly shadows. By 4PM the shadows were beginning to migrate across the stream in all areas, so I clipped my fly in the rod guide and returned to the car to prepare for the drive home. As I walked across the bridge I paused and observed the water. I could discern the outlines of at least ten trout in the wide shallow area just above the bridge. One fish appeared to be a brown trout at least 15 inches in length, but my presence high above on the bridge appeared to spook many of the fish. I decided not to approach from below and attempt to increase my numbers, and I made a mental note of the spot, and I’ll be there again at some future date. Maybe I’m learning to relax and enjoy the day and worry less about the numbers. Maybe. 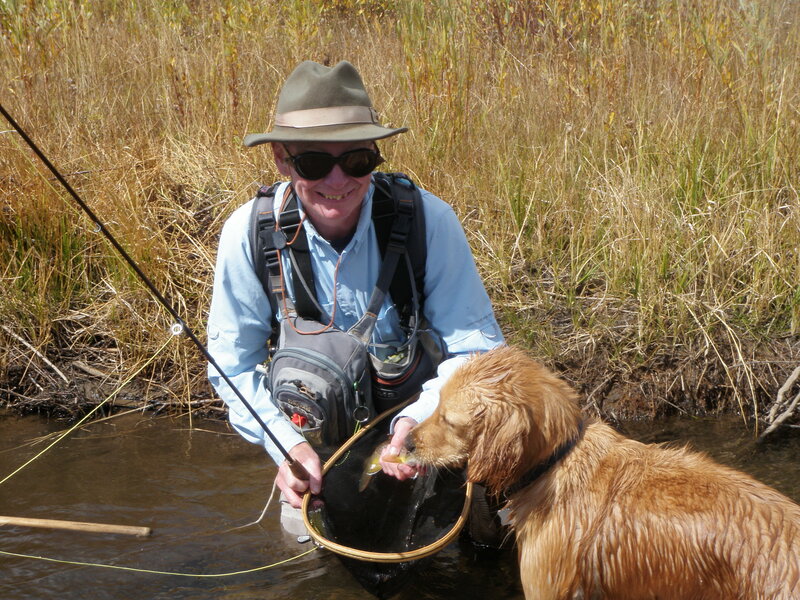 When I spent a weekend at Gregg Sutherland’s cabin, we hiked in to Wildcat Canyon with his golden retriever Angie and along the way Gregg caught a couple grasshoppers, clipped their wings, and tossed them in the river. In both cases we watched as the hopper drifted downstream 8-10 feet and a fish confidently rose and inhaled the hapless creatures. I inspected the body of the hoppers and they were a segmented cream color. I decided I needed to tie some cream body parachute hoppers for my fly collection. 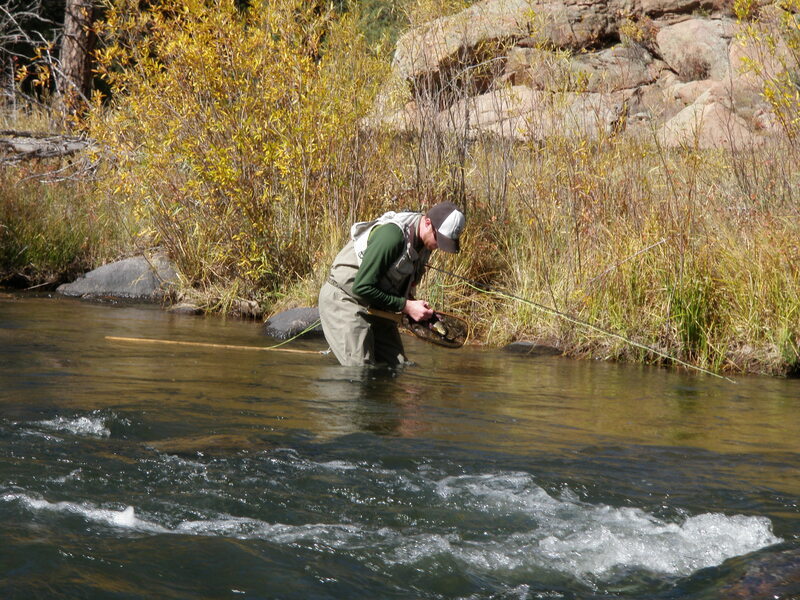 On my last trip to the Big Thompson I had great success with a size 16 light gray deer hair caddis and broke my wading stick. I inspected my light gray caddis supply and was surprised to learn I only had a few remaining. 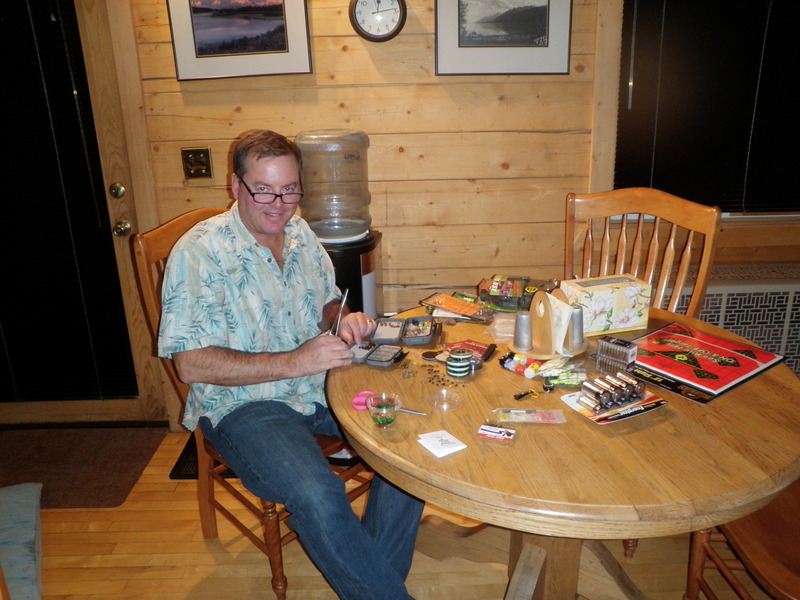 Clearly I needed to get busy and tie some more light gray caddis for late season fishing. The weather forecast was predicting a four or five day stretch of beautiful Indian summer weather for Denver culminating in projected highs in the low 80’s for Saturday. I called Dan early in the week and asked if he’d be interested in a hike into Wildcat Canyon on Saturday. He agreed to join the adventure, and Jane signed up for the hiking aspect as well. On Thursday evening I sat down at the vice and cranked out four cream body parachute hoppers and on Friday afternoon I wrapped things up early at work and returned home to craft a new wading staff made from a street hockey stick. Next I returned to my fly tying desk and quickly made eight size 16 light gray deer hair caddis. I divided the hoppers and caddis flies between my fly patch and a small fly box for Dan. Everything was set and Dan arrived on Saturday morning at 7AM, and we packed the car with our fishing gear and lunches and began our drive. When we arrived at the turn off on the dirt road that reaches the Platte River trailhead the temperature was 33 degrees, and it improved to only 35 when we parked and began stuffing our backpacks for the two mile hike to our fishing destination. We arrived at the river by 10:30AM and set up a base camp at the same location we used last October and when I did the same trip with the Costantini’s in late August. Jane put down her blanket and prepared to read her Kindle while Dan and I pulled on our waders and then hiked down the path a short distance. The air temperature was warming as the sun moved higher in the blue sky and I fished with only a fleece over my fishing shirt. The river was running higher than normal, but still quite clear. Dan waded to the far side and I took the bank along the path. I tied a cream parachute hopper on Dan’s tippet and I decided to prospect with the light gray caddis. On Dan’s second cast he hooked an 11 inch brown, but it broke off the hopper as he was attempting to net it. He replaced the hopper with his second cream hopper. Nearly simultaneously I hooked a brown on the caddis as it began to drag at the end of a drift. It was a great start to our day, but would it continue? In my case I continued working my way up along the right side of the river with the caddis, but nothing was responding. I wasn’t even observing flashes or refusals to the fly that had been so popular on the Big Thompson. I decided that I needed something more visible and tied on one of the two cream parahoppers I’d allocated to my fly patch. 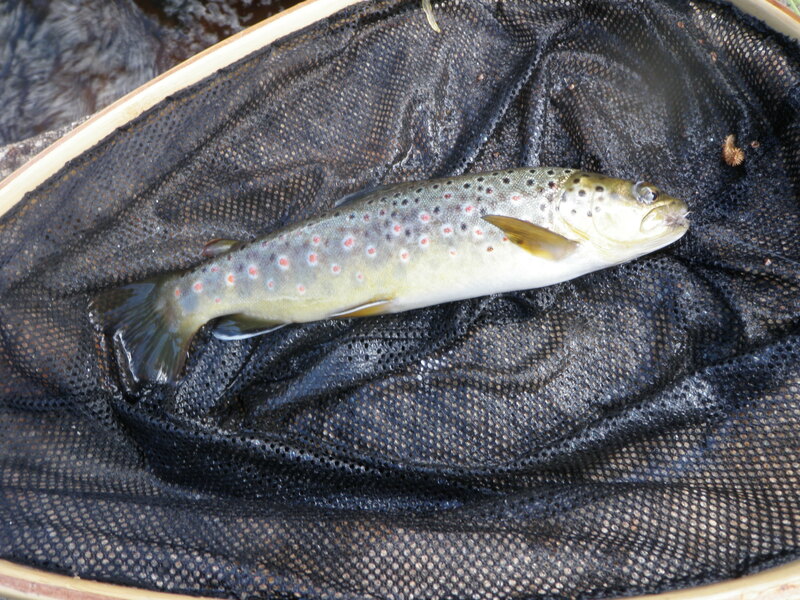 Again I began prospecting the attractive side pockets, small pools and runs of moderate depth, but once again no trout showed interest in my offering. Meanwhile Dan wasn’t having any success either. When I reached a wide juicy run with moderate current and water depth of three to four feet, and I didn’t get any response from the hopper, I stripped in my line and added a beadhead hares ear. This turned out to be a plus, and I quickly landed two browns on the beadhead hares ear. I called out to Dan and moved on up the river and landed two more browns before lunch. We decided to quit for lunch at around 12:15 and walked back to the base camp and met Jane as she was walking down the path to meet us. Dan told me he experienced refusals to his hopper and then tied on a caddis and had refusals to that as well. When I called out that the BHHE dropper was working, he attempted to add a dropper but wasn’t tying the connecting knot to the bend of the hook properly and spent quite a bit of time trying to solve the bend knot riddle. After lunch I coached Dan on tying the simple loop knot I use to connect the tippet to the bend of the top fly and then added a beadhead hares ear to a cream body Letort hopper that I pulled out of his fly box. We returned to the place where we’d exited the river for lunch, and Dan actually went back to the hole where he’d experienced the successive refusals and landed a brown on the beadhead hares ear. Meanwhile I spotted a few BWO’s emerging so I decided to try deep nymphing given the higher flows and sparse emergence. There was a lot of aquatic vegetation floating in the river that had apparently been dislodged by the higher flows. Perhaps this meant that there were scuds available to the fish, so I tied an orange scud as my top fly and added a size 22 RS2 as the trailer and began working the deeper runs with a strike indicator, split shot and this two fly combination. This didn’t produce anything, and I was constantly plucking vegetation and slime from my flies while Dan was catching fish at a fairly frequent pace, so I abandoned the deep strategy and went back to the hopper/dropper technique. It was worth an experiment, but wasn’t the right strategy for October 15. Instead of using one of my valuable cream body hoppers I settled on a gray body parachute hopper that was pretty badly mangled from previous usage. The hackle was climbing up the wing post causing the wing to tilt forward in the water, but I was more interested in using the top fly as an indicator and liked the visibility of the white wing. I added a beadhead hares ear and then a RS2 and began prospecting. Dan had pretty much caught up to me, and he worked his way upstream along the left bank slightly behind me. I began to catch fish with increasing frequency, and they were smashing the beadhead hares ear. My first goal was to land eleven trout to reach 500 for the 2011 season, and this milestone fell by the wayside pretty quickly. In fact number 500 came out of the sweet pool next to our base camp. I let out a whoop, but before I could celebrate further a man with his dog appeared, and I didn’t want to brag about my accomplishment so I calmed down my demeanor to greet the stranger. Once they moved on I resumed a small celebration with Jane. 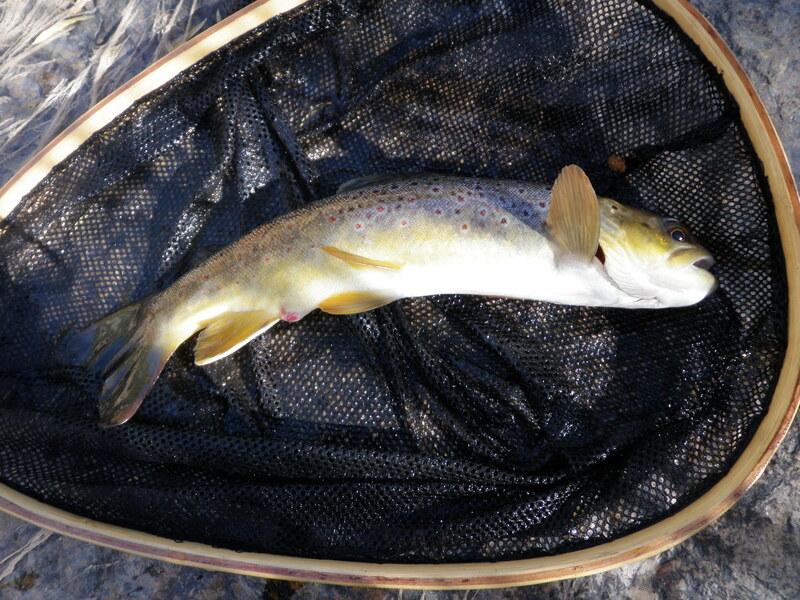 I continued upstream and by the end of the day had accumulated 23 trout landed. All except two were brown trout and all except three took the beadhead hares ear. The first fish attacked the caddis and I landed one on the RS2 in the deep pool and one nice brown slurped in the bedraggled gray parachute hopper. Meanwhile Dan was on fire with his beadhead hares ear. When he reached the high rocks next to the juicy pool next to our base camp he climbed up to a high vantage point and could see five trout swimming in the deep pool in front of him. He cast his hopper/dropper in their midst and watched as a fourteen inch rainbow slowly rose up and slurped the Letort hopper. He was now challenged to lift the behemoth rainbow seven feet above the water to his perch, but he realized this wasn’t a recommended move and somehow scrambled back down the rock to a lower position and landed the biggest fish of the day. 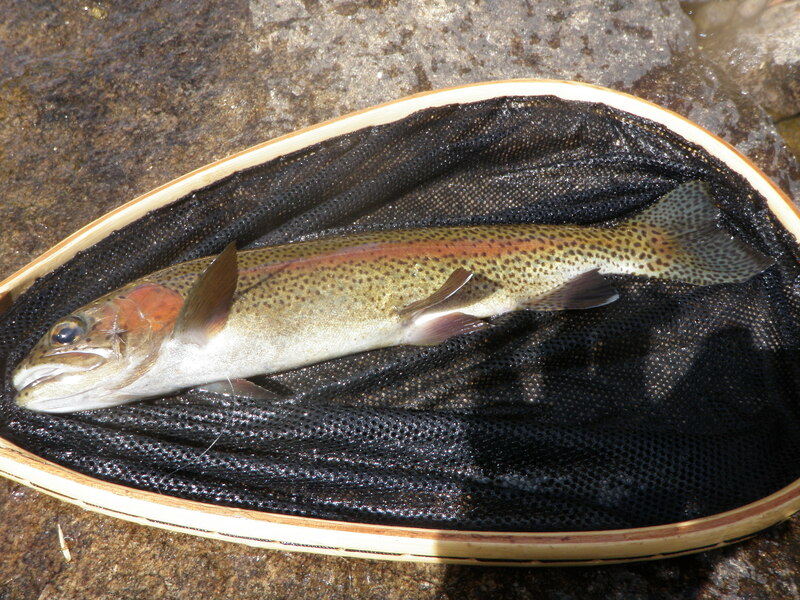 Shortly after this catch, he landed a second slightly smaller rainbow from the same pool. After this success he continued working up along the left bank making nice upstream casts and landing a series of browns that grabbed the trailing hares ear. At the end of the day Dan estimated he’d landed around 12 fish. It was quite a day in Wildcat Canyon. For the first time, I was ready to quit for the day and Dan suggested we each catch one more fish. Usually Dan is ready to quit way before Dad. 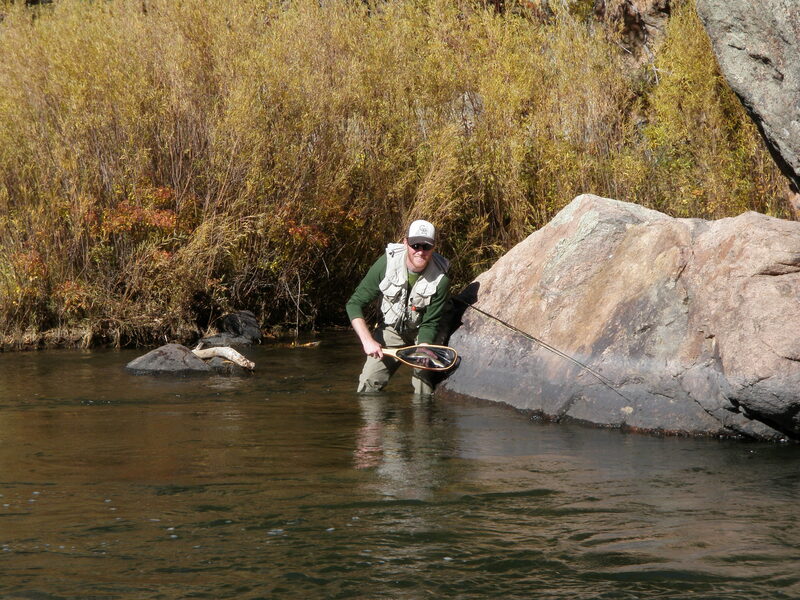 Would you expect to have one of the best days of the season fishing with dry flies on the Big Thompson River on October 5? I didn’t, but in fact that’s what occurred so read on. The weather was forecast to continue nice albeit cooler than the recent run of 80 degree days, although mid-70’s in Denver is still bonus time in my opinion. 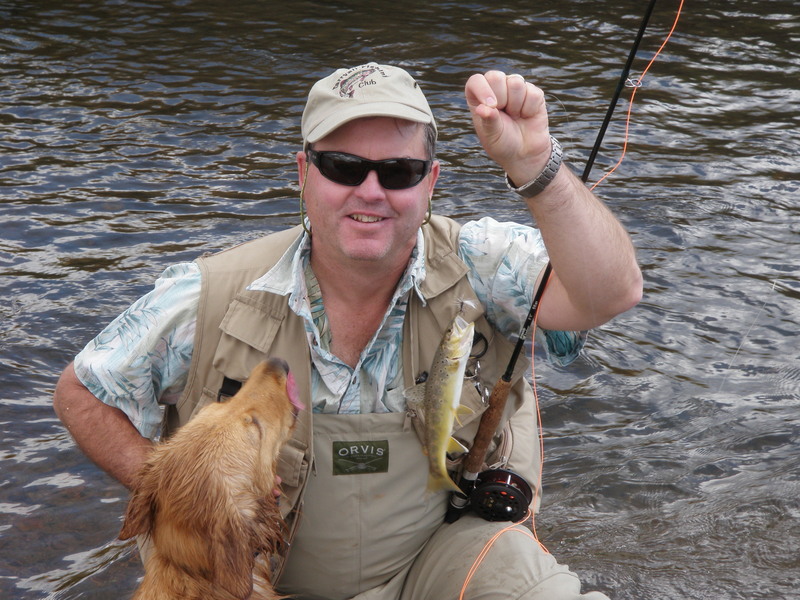 With a trip to Hilton Head looming from October 7 through October 12 I was itching to get in another day of fly fishing. Jane and I had tickets to a Broadway musical for Wednesday night, so I needed to visit a close destination and elected to drive to the Big Thompson River below Lake Estes. The report from Kirk’s Fly Shop indicated flows were 67 and from experience that is a nice comfortable flow. The web site suggested fishing royal humpies and caddis as dries and for nymphs a myriad of RS2-like subsurface patterns. I got off to a nice early start at around 7:30AM and arrived at the stream and was prepared to fish by around 9:00AM. The air temperature on the dashboard was 56 degrees so I wore a layer of fleece and a rain jacket as a windbreaker. I drove to the upper river and parked just before the first bridge after Noels Draw which used to serve as the upstream border of special regulation water until it was extended to the dam. I waded to the far side and tied on tan parachute hopper trailing a RS2. I cast this as I worked upstream for twenty yards with no response so I switched the hopper for a small olive stimulator. The stimulator was probably a size 12 2XL and I continued to fish with the trailing RS2. This combination served me as I fished to the bend, and I landed two browns on the RS2. The stimulator was generating a few refusals, but the fishing was definitely slow as I began thinking about the suggested flies on the web site. I’d stocked four red humpies in my fly box and considered tying one to my line. But then I remembered the caddis and decided to tie on a size 16 deer hair caddis with a light gray body. I did spot occasional caddis dapping the surface of the stream so perhaps the fish were used to seeing these insects when the food supply was lean late in the fall. Almost immediately a small rainbow attacked my caddis just as it began to drag away from the bank under some overhanging branches. I glanced at my watch and noticed it was around 11AM, and I’d now landed three fish. As I worked around the bend I landed three more rainbows in short order and several were quite nice fish in the thirteen inch range. The fish weren’t rushing to explode on the flies on the surface, but instead were slowly rising and sipping the caddis with confidence. It was 11:30 and I had now netted six fish so things were picking up. 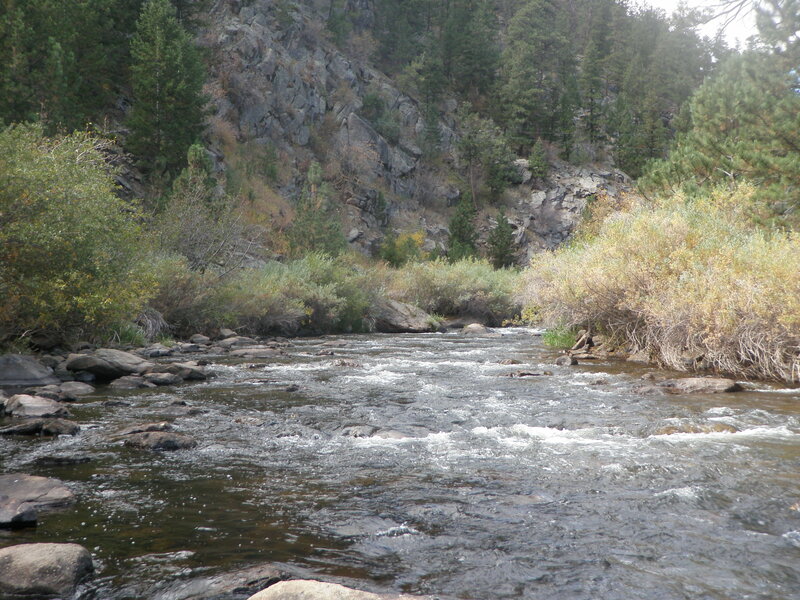 Since it was now late morning and the air temperature was warmer, and I switched flies, and I was fishing water on the opposite side of the river from a cabin with no trespassing signs in the front; it is difficult to assess which variable caused the improved fishing success. The next two hours proved to be magical. 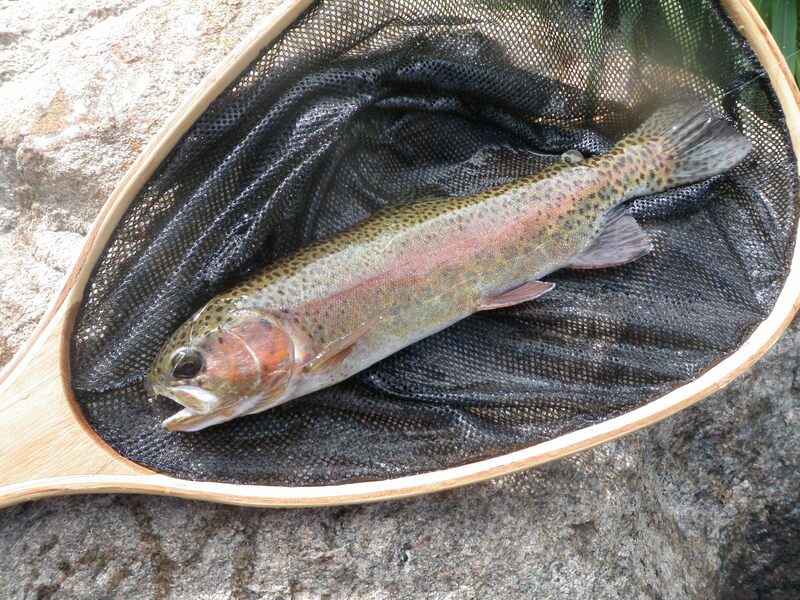 I continued casting the caddis up along the left side of the stream, and I was consistently rewarded with confident sips and gulps of primarily rainbow trout. The most difficult aspect of this fishing was following the small size 16 fly as clouds intermittently covered the sun creating a glare. I managed to change the angle of casting and viewing frequently and on several occasions when I lost my fly I noticed a nose and mouth rise above the surface at which point I set the hook into nice fish. 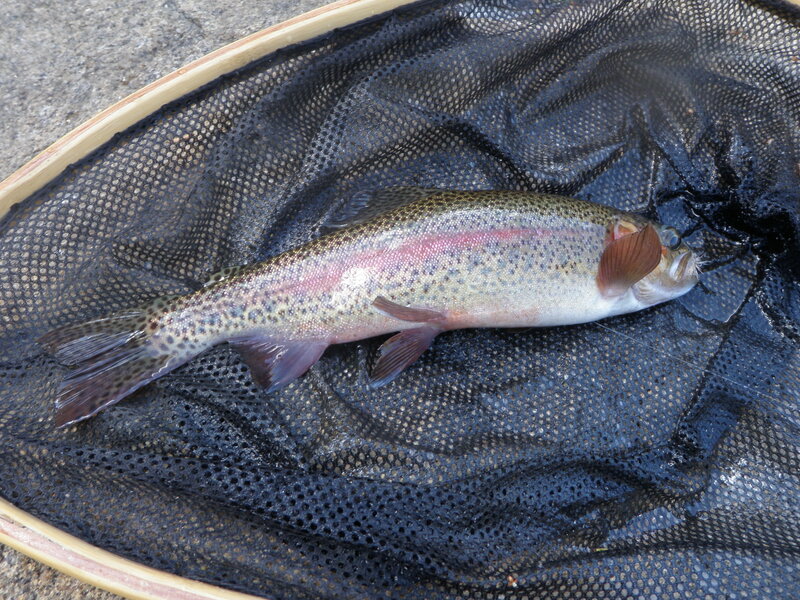 Several of the rainbows appeared to be in the fourteen inch range and that’s at the top end of the size range for the Big Thompson fishery based on my experience. I continued beyond the cabin a bit and as I released the twentieth fish of the day glanced at my watch and was surprised to learn that it was 1:30PM. The fishing was so good that I skipped past my normal lunch hour. 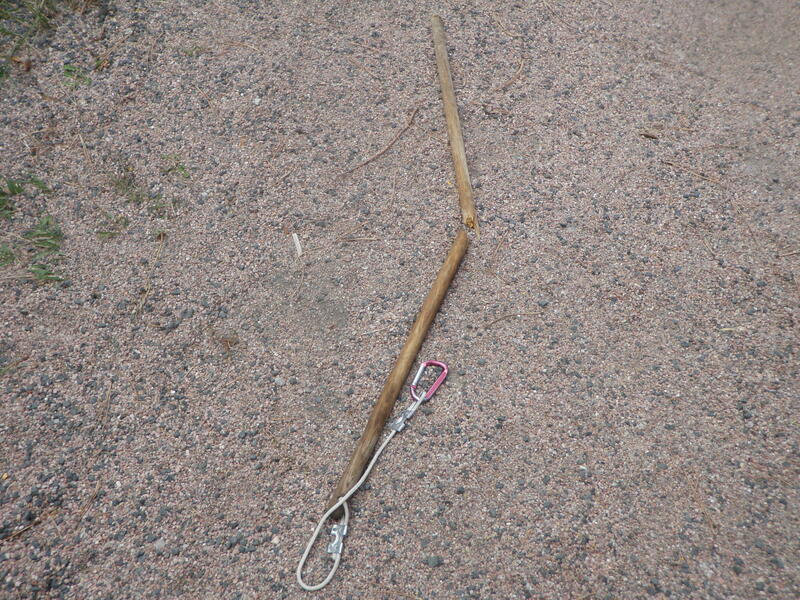 As I was leaning on my wading staff to cross the river to the road and return to the car it snapped in half. This was the second outing in a row where my wading staff malfunctioned. I picked up the broken end and returned to the car and decided to drive further downstream and test the caddis at a different location. There were a few other fishermen, but the fishing pressure was clearly down from my last visit. I don’t know whether this is attributable to it being a Wednesday or the later date in the season. I ended up stopping at a small pullout just above the exit from Grandpa’s Retreat and quickly munched my lunch on a rock overlooking the fall scene along the river. After lunch I went down the bank and found a dead branch that would serve as a temporary wading staff to cross to the side away from the highway. 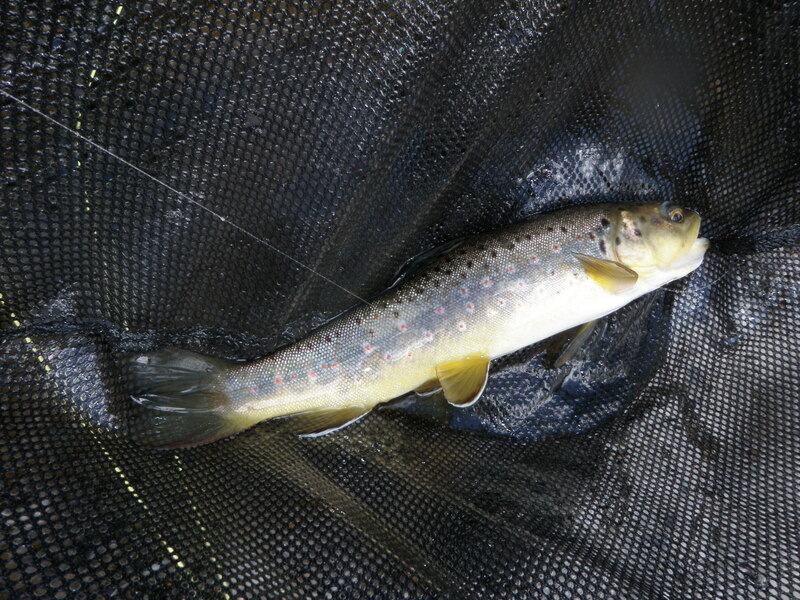 I began fishing the caddis similar to the previous location and once again began connecting with fish, although these fish were predominantly brown trout and smaller in size than the earlier fish landed. Five fish were landed in the next hour or so as I worked upstream in front of three or four cabins on my side of the river. The sky was getting even cloudier, and the glare was even more difficult to deal with than earlier in the day. There was a car parked at one of the cabins, and I didn’t feel comfortable fishing right in front of the cabin, so I found another branch and crossed to the bank along the highway and worked further upstream. The glare was just as bad on the road side of the stream, and now I began to experience refusals to the caddis. I spotted two or three BWO’s rising slowly through the air, so perhaps the fish had switched to BWO’s? I planned to quit by 3:30 so I could return to Denver and watch part of the Phillies vs. Cardinals playoff game so I didn’t bother adding a RS2 dropper or switching to a CDC BWO or red humpy. I stalled on 25 fish for the day and didn’t add to my count over the last 45 minutes or so. But even with the slow ending to the day, it still qualifies as one of the better days of the 2011 season particularly the hot stretch between 11:30 and 1:30. The gray parachute hopper produced for half an hour on Clear Creek during my last visit and worked great on Tarryall Creek so I was anxious to return to Clear Creek with a fresh supply. 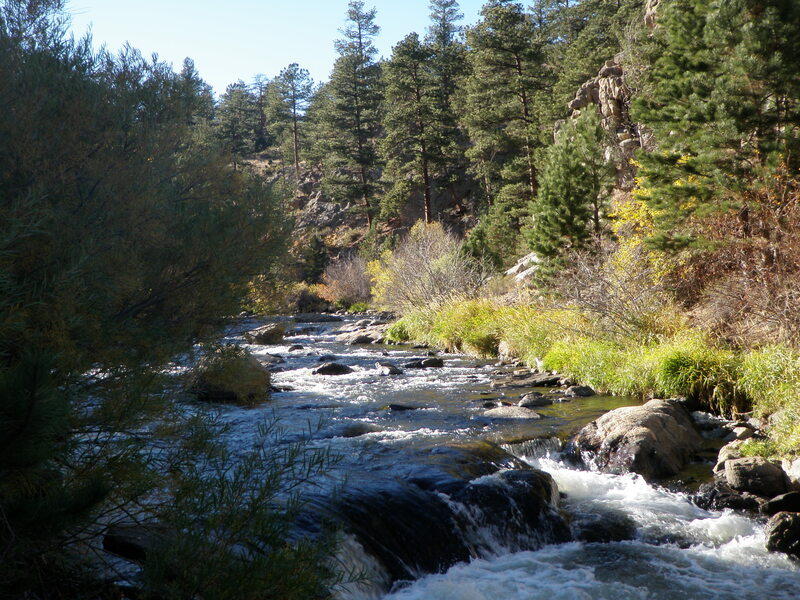 During my last visit I vowed to cross to the opposite bank and fish back to the parking lot since I felt the stream flows remained high and few fishermen ventured to the bank next to I70. I finished closing August at work and quickly logged off my computer and drove home, ate lunch and tossed all my fishing gear in the Santa Fe. I left the house at 12:45 and arrived at the parking area near the Hidden Valley exit off I70 by 1:30. By the time I put on my waders and rigged my rod and hiked down the path, crossed the stream and then hiked down the shoulder of I70 it was 2PM. I tied on a parachute hopper and immediately had a refusal and then experienced a momentary hook up and then foul hooked a brown. I had lots of action but nothing to show for it. I continued working all the likely pockets and gradually landed a few fish, but there were more refusals than fish to show for my efforts. After I’d landed three fish, I decided to try something different and replaced the hopper with a lime green trude and seeing a few small mayflies in the air prompted me to add a RS2. 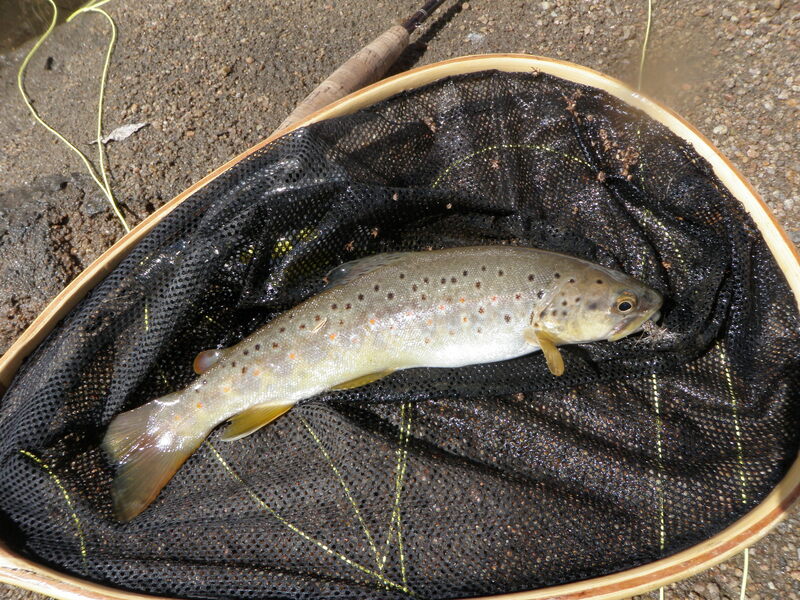 In a nice narrow pool next to the bank I spotted three or four fish rising sporadically and after numerous casts got a 10 inch brown to grab the RS2. This combination however was not working consistently so I tried a Chernobyl ant trailing the RS2. This caught one brown on the RS2, but that was it, and I wasn’t even seeing refusals to the Chernobyl so I returned to the gray parachute hopper. It was around this time with a fish count of five that somehow my plastic canister that contained my large dry flies and attractors fell out of my front pack. I immediately dropped my rod so I could use both hands to scoop the plastic container from the stream. In the process of doing all this I broke the rope that connects my wading stick to my belt. I recovered my rod and reel and then began looking for the rope and clip that previously attached my stick to my belt. Eventually I realized it was still on my belt, but it slid around behind me. I looked for a means to reattach the wading staff to my belt, but didn’t see a solution, so I proceeded upstream casting the parahopper to likely pockets and wedging the stick in rocks as I moved along. This worked fairly well as I landed three more browns among numerous refusals. 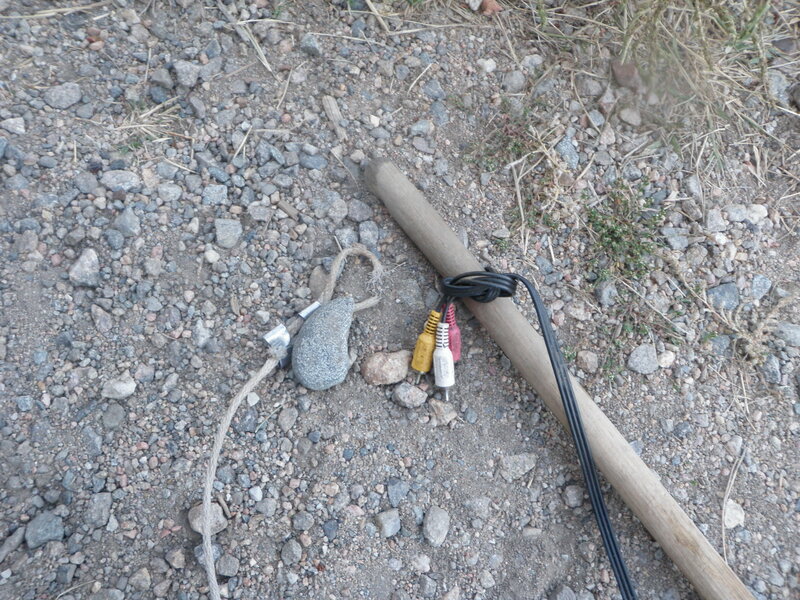 After ten minutes of fishing I spotted audio cables among the jumble of rocks along the creek bank. The cables were coiled and held by a twisty so I removed the twisty and used it to connect the remaining rope to the wading staff. Then as a safety net I used the audio cables to connect the stick to the belt in case the twisty couldn’t handle the stress. This setup sufficed until I returned to the car at around 5PM. In 1982 I hired Gregg Sutherland as my summer intern when I was Manager of District Accounting at Air Products. Gregg was from Casper, WY and working on his MBA from Wharton at the time. Gregg and I stayed in touch, and he and I eventually ended up in Denver together. Gregg purchased a cabin in South Park a number of years ago, and I visited with him then as he was beginning the task of remodeling. Earlier this year when I was attempting to find a partner for my Alaska trip I contacted Gregg, but he was too busy with work and had another trip he’d already booked to hunt in Africa. 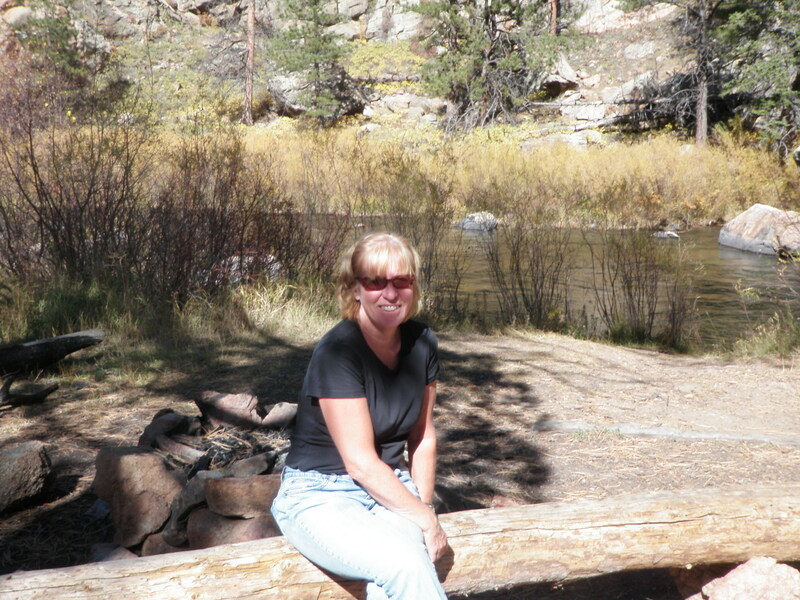 While Amy was visiting in early September, Gregg called to chat but I was out of cell range so I returned his call on my return trip from the Arkansas River on Sunday, September 23. 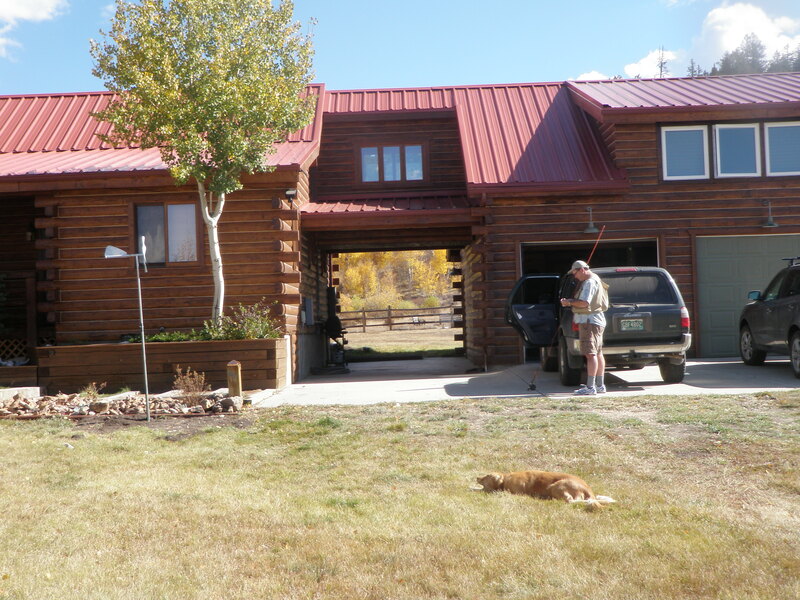 Gregg invited me to join him at his cabin during the weekend of September 30 – October 2 and I accepted. Gregg’s fishing vest and other valuables got stolen the previous week, so I met him on Friday evening at Bass Pro Shop as he purchased a vest full of goodies including flies, hemostats, nippers, split shot, strike indicators, etc. His total bill to replace his fishing vest was $650! Next we drove to his house in Golden to pick up Angie, his golden retriever, and then we stopped at the supermarket in Aspen Park to buy groceries for the weekend. We arrived at the cabin in South Park near Tarryall Reservoir late on Friday night and slept in until around 8AM. By the time we ate breakfast and organized everything, we arrived at the stream by 11AM. 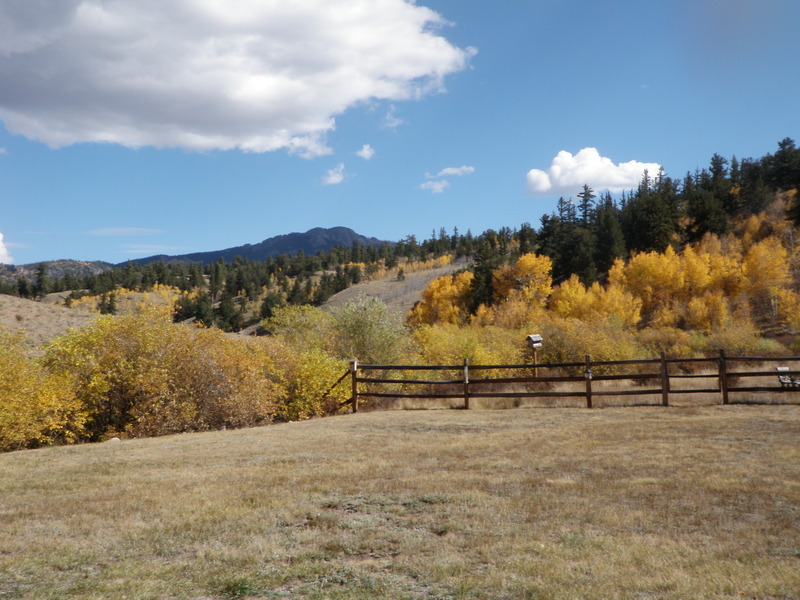 The residents of Lost Creek Ranch pay homeowners’ dues which gains them access to 9 miles of private stream water and three trout ponds stocked with fish. Gregg and I parked at the upper access point and then hiked east to nearly the middle access. Tarryall Creek is a relatively small stream approximately 15 feet wide that meanders through the high elevation South Park meadows. Gregg and Angie started out working the right side of the river, and I took the left. I tied on one of the nice gray parachute hoppers I tied on Thursday night and began working the left side of the center run while Gregg cast a stimulator to the right side. I placed a cast in the very top of the middle run and after a three foot drift, a nice twelve inch brown sipped it in. 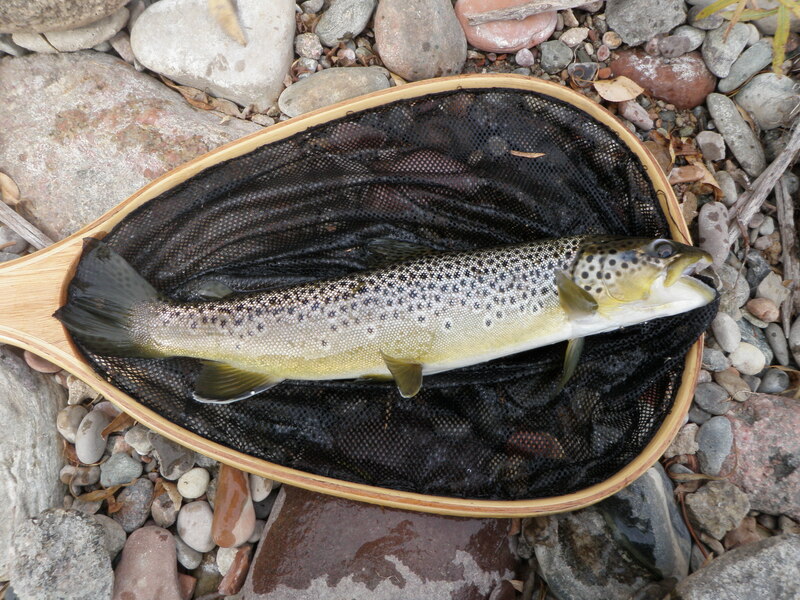 This repeated in the next several runs, and I quickly landed three browns. Gregg worked the next set of decent stretches of water and finally accepted a gray parachute hopper from me. 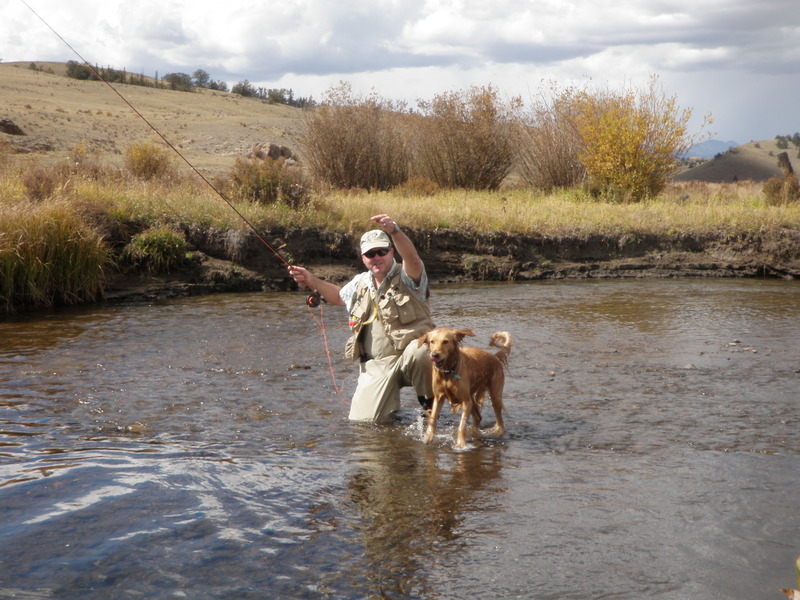 He began to catch fish on the hopper as well and we continued alternating fifty yard stretches of stream. When Angie was present and I landed a fish, she would splash across the stream and kiss my trout before I released it. 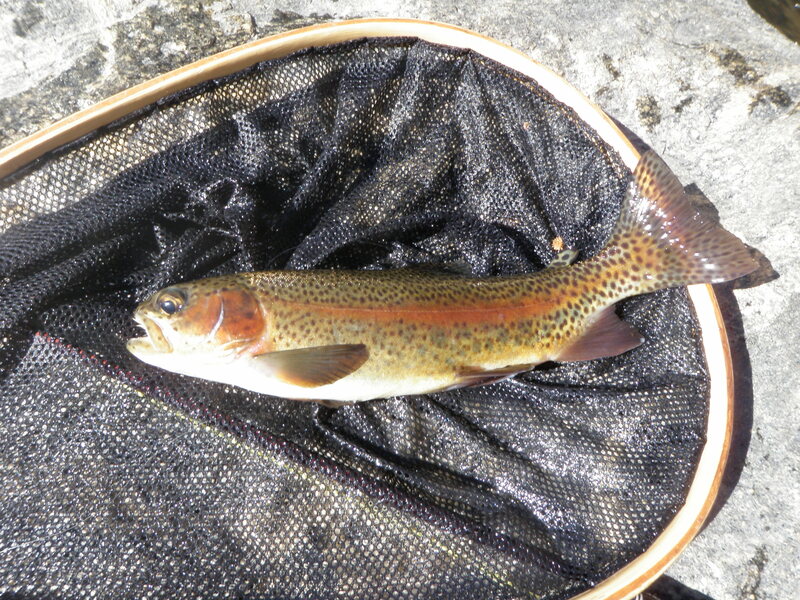 Over the course of the afternoon I landed 12 trout, all browns except for one rainbow. Most of the catches inhaled the parachute hopper, but I did manage to catch one or two on a RS2 and two on a trailing hares ear nymph late in the afternoon. Very late in the day I reached a deep slow moving bend pool and after approaching cautiously noticed a fish sipping something on the surface along the left bank. I expected to have to clip off the hopper and the two trailing nymphs but decided to put a cast in the area where I’d observed the rises. 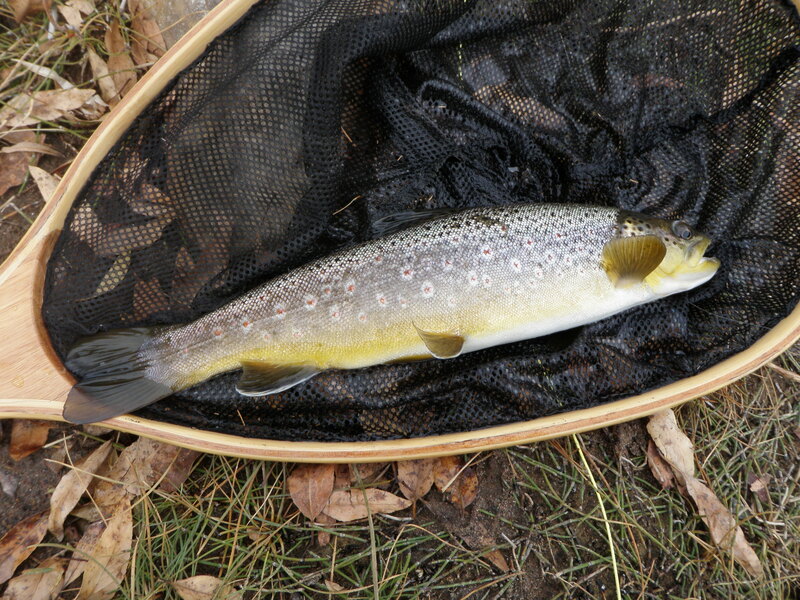 The hopper landed and drifted a couple feet when the sipping brown ambushed it, and I landed a decent brown by Tarryall standards. Because the stream was low and clear, we skipped quite a bit of shallow water without much structure and fished mostly the runs and pools at the large bends in the creek. The sky clouded over periodically in the afternoon, and there was a very sparse BWO emergence around 2-3PM. This prompted me to add a RS2 to my offerings, but the trout seemed unimpressed. 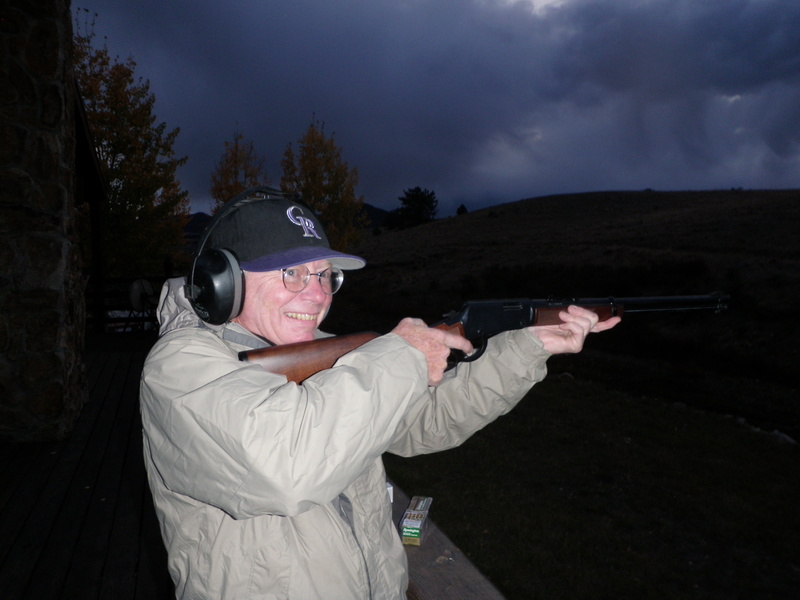 By five o’clock we were tired and returned to the cabin for some target shooting with Gregg’s rifle.